I don't really care that Google is tracking what I click, and I don't really care about the extra indirection when I click on a result (though both are concerns). But I find it annoying that I can't copy-paste a result by simply right-clicking on a link and choosing “copy link address” (I want to get the real result, not Google's redirection to it). I want to have the direct URL http://en.wikipedia.org/wiki/Foobar, at least for copy-paste purposes, in Firefox and Chrome. Some time later, Google changed to provide indirect results in all browsers. In a browser without JS, the HTML still contains indirect results. In a browser with JS support (at least in recent Firefox and Chrome), the HTML contains a direct result in the href attribute, but there is an onmousedown attribute that invokes the rwt function which does rewrite the link. 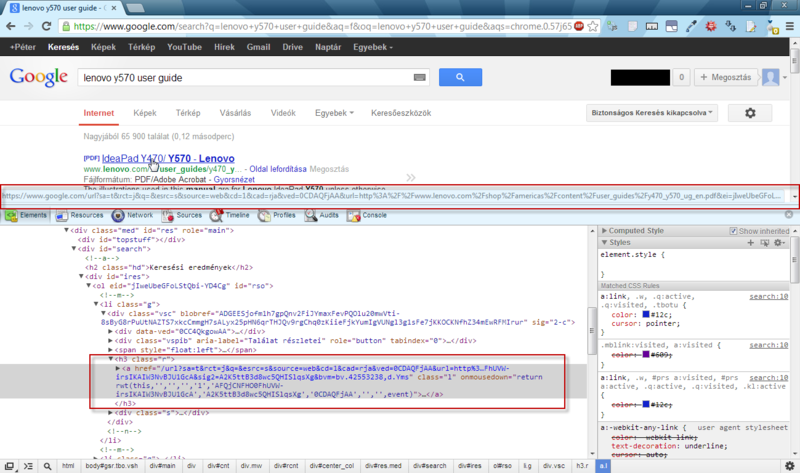 You see the direct link when you hover, but you get an indirect link like the one above when you click or copy-paste. Author's note (July 2016): The answer below was written in 2011, and is still working in Google Search. I have published new extensions that use a different method to remove the search result indirection, which works on even more Google sites and on mobile. TL;DR: Don't track me Google is a user script Don't track me Google is an extension I made that allows you to copy normal URLs, while hiding the referrer to the sites you're visiting. "Don't track me Google" at the Chrome Web Store (updated in 2016). "Don't track me Google" for Firefox (desktop & Android) (since 2016). I have written a method which replaces the link-modifying rwt function with a bogus function that can't be touched by Google. By preventing Google from overwriting the rwt function, the link cannot be modified any more. This method depends on the Object.defineProperty method (Firefox 4+ and Chrome 5+). The fallback requires Firefox 2+ and Chrome 1+. Google Chrome does not support Magic TLDs, so the closest you can get is *://*.google.com/* (repeat the rule, replace .com with other supported Google TLDs). In Chrome, scripts have to be injected in the form of a <script> tag, because Content scripts are executed in an "isolated world". On January 21st, 2012, I published an extended version, which includes a referrer-hiding method, so that others cannot see your search query. This greatly improves your privacy. The mechanism is explained at this answer on Stack Overflow. Additional details are available at the source code and Don't track me Google description, a user script which fixes the URIs and hides the referrer. See if the userscript found here for Google search works for you. I have been using it for a while now, and it's been working more often than not for me. Appears the rwt function is invoked upon onmousedown, and thereby rewriting the href. If we could override this behaviour, then we should be set. Edit: Great to see that the userscript @Rob has created and included in his reply takes advantage of this snippet, highly recommended! I use the Firefox Redirect Remover add-on. After this is installed, right click on a redirected URL in the browser gives an option to copy cleaned URL. For short URLs, you can just copy the green text under the title as that's the same URL just without protocol lead. For long URLs (those that have ellipsis in the green text), you either need a script or use a semi-complex workaround. A script is necessary because Google modifies links with its own script on mouse click. If you hover over a results link, you'll notice in the status bar that it displays properly but it changes upon your interaction with it. The workaround consists of opening Developer Tools in Chrome or FireBug in Firefox, selecting the link with element inspector, and copying the content of href attribute. This requires 2 windows to be open, so it's not the most convenient workflow on smaller screens. You could've done it with View source but Google Instant sometimes results in strange source. Also, in order to find the link in the source you must remember its title as there's no visual selector as in Developer Tools & FireBug. If you want to keep Google's redirection and only selectively copy & paste some URLs here are other possibilities which do not require any change in the browser. Unfortunately while the solutions work in Firefox they do not seem to work in Chrome and Internet Explorer any more. Then press the context menu key or Shift+F10 and select “Copy Link Location” / “Copy Link Address” (hot key: A in English Firefox, E in English Chrome). For faster navigation in Firefox using the mouse, you can click a white-space or an non-link text before the link and then press Tab. You can also switch to the caret navigation using F7 and use cursor keys or Tab. In some browsers and environments (e.g. Firefox on Windows) it is possible to press the right mouse button outside of the link, move the mouse cursor while keeping the button still pressed and then release the button on the link to invoke the context menu. The described ways avoid clicking the mouse on the link and invoking the onmousedown event which causes the conversion of the original URL. Note that if you already clicked the link, you must reload the search results page (F5) to get the original URL back. These sites will give you the URLs that go directly to the target sites, no more redirection. Please note that the search results from these sites will be a little different from the normal ones ( by using google.com ). Just bookmark that page and then paste 'horrific URLs' into the form to convert them into a normal links. For shorter links, selecting the green text is fine. For longer links with an ellipsis, I tend to just open the link and grab the URL from the address/awesome/omnibar. Not the answer you're looking for? Browse other questions tagged google-search privacy or ask your own question. Google copy link location annoyance? Why does Google Search use redirects instead of direct links? 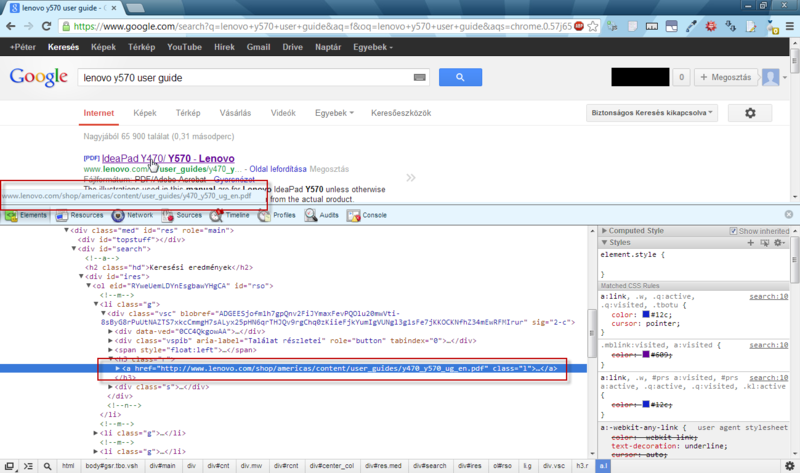 How to set English and Prevent others in Google when ncr/append-en/… fail? Why doesn't Google's “I'm Feeling Lucky” feature work in this specific case? Is there a quick way of getting a beautiful URL to a Google search query? How to view the original URL of a file, which only causes a popup when clicked? How to have keyboard shortcuts in Google Search not skip over results?